This mountain range appears to be a fault scarp sloping toward Mare Nectaris. It is quite prominent a few days after its sunrise. The Altai Scarp and the walls of Theophilus/Cyrilius/Catharina make a double ring of mountains around Mare Nectaris, rather like the double ring around Orientale, except that only half of it is readily visible. This is the best chance we earthbound observers get to see "live" something like what Orientale looks like face-on in the spacecraft pictures. There is a very prominent catena stretching from near Piccolomini toward Polybius E and through Polybius R. Nearby, there are many smaller catenae visible, running parallel to the more prominent one but composed of much smaller craters. See also Morio Higashida's image of Rupes Altai. With similarly-sized Cyrillus and Theophilus, just to the north on Rukl chart 46, a prominent "landmark" feature, easily recognized and useful for orientation, on the eastern side of the great and confusing mountainous peninsula that occupies the south-central portion of the Moon's visible disc. 3/4/98: Catharina was playing Rorshach games. It looked quite different than Rukl's illustration. I couldn't decide whether it looked like it contained a crab with a sea anemone on its back, or a gnome with his arms over his head. No, I wasn't drinking Russian Vodka. See also the image on chart 46. Near sunrise, Catena Abulfeda looks not like a chain of craters, but more like a thin, very bright line, running tangent from one wall of Abulfeda to the opposite wall of Almanon. An odd feature caught my eye -- a line of craterlets and something vaguely like an extended valley running from near the southern tangent of Catherina to the southern tangent of Abulfeda. For once, it was something: Catena Abulfeda! I really enjoy independent discoveries in some childish way. 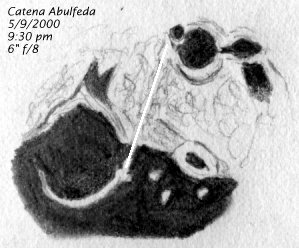 I am fairly convinced after pondering Catena Abulfeda tonight that it must be an old fault, sort of like a more "mature" Rima Hyginus, whose catenish character was easily seen. If you have not yet pondered Catena Abulfeda, you should definitely try to keep track of this area. It's one of the best crater lines on the moon, and is all the more interesting for cutting through such rough terrain west of the remains of Catharina. See also Abulfeda, chart 45. The silly-named Sacrobosco is nicely shaped and has three nearly perfect medium craters inside. I noticed another bridge: perhaps the rival of O'Neill's bridge, or maybe better. Rukl shows it on Chart 57 as the northwest wall of Polybius K, but the drawing doesn't begin to get the idea across. For one thing, K doesn't really look much like a crater; more like the end of a slump that starts near Catharina and runs between Polybius Prime and C, skirting a highland that sits basically between Prime and B. The slump terminates at the far wall of K.
Through the eyepiece, it looks like a box canyon between two highlands, with a thin (and extremely straight) bridge running across. All materials on the Hitchhiker's Guide to the Moon are © Copyright the individual authors. The Hitchhiker's Guide to the Moon Compilation is © Copyright 1999,2000,2002 Akkana Peck.